The vet was concerned that the 3rd little puppy shown on the x-ray was only 1/4 the size compared to the other two littermates and was premature in development. The puppy had passed away inside of the mother and the other two pups were quite large for their age, about 200g in weight. The breeder of this litter asked me to take on the challenge in being the mid-woof and assist in getting the pups out. I accepted. It was tense, but I did it. There were two live puppies, but no 3rd puppy. The labor started at 4:00 AM. I was up all night. At 8:00 AM I assisted in the delivery of pup number 1. There was brown goo from the dam. It took me 2 hours to get the 2nd puppy out. All went well as I knew what to do. 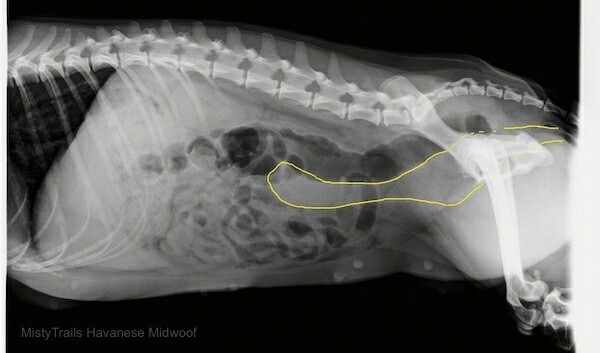 The x-rays CLEARLY showed that there was a third puppy and that its bones were formed. I was ALL prepared to look after the wee one. I had all of the critical care equipment including an incubator and tube feeding stuff ready. However, there was no 3rd puppy. The body broke the dead puppy down in 3 days. 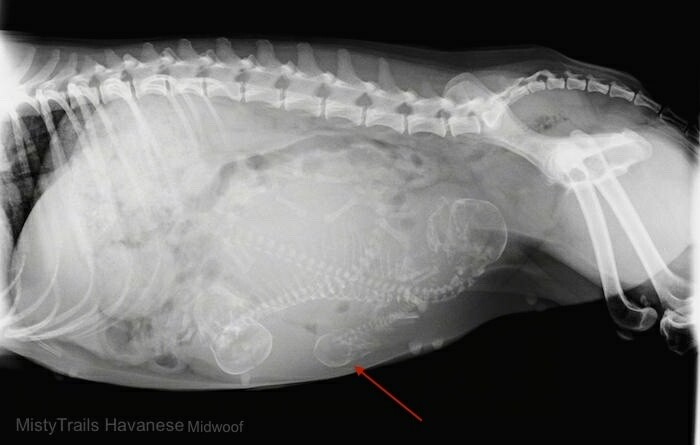 The x-rays that were taken after the delivery of the first two puppies showed no retained pup. It is amazing how the body absorbed the dead pup in the 3 days since the last x-ray. It was coming out as black sludgy goo. I have the mother on antibiotics. The mom is not producing milk yet, but when she is and the pups start gaining weight, they will all go home, likely in a bout 3 days. The mom is happy and the pups are doing well. The breeder of this litter came to visit. A wonderful story and what I love to do, help puppies.